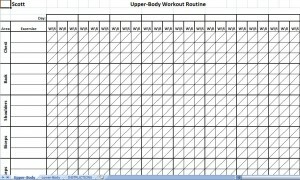 You can track your workout progress with this Printable Workout Log template for Microsoft Excel. This Printable Workout Log workbook contains three worksheets in a single template. It won’t cost you a dime to download the template because the Printable Workout Log is absolutely free on this page! Before your next workout, simply print off the workout log and you’re ready to go! Get the workout log for free today! the work out log is a great tool!